To weigh your puppy correctly, weigh yourself holding your puppy in your arms, then weigh yourself without your puppy and substract the latter from the first. For newborn puppies up to 2 kg (about 5 lbs) you can use a kitchen scale. Preferably use a scale that you can easily set to zero, so that you can easily add an item to make your puppy more comfortable on the scale without influencing the final result. This crucial growth stage requires a very high-energy food, that takes into account the underdeveloped digestive ability and garantees the proper intake of both calcium and phosphorus that are critical at this stage. 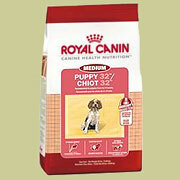 Your new puppy should be fed the same type or brand of food it received from the breeder where you bought the puppy. It is important not to change the puppy's diet during the first three to four months in order to avoid digestive problems and diarrhea. 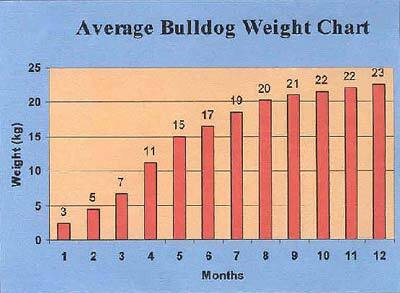 If it is necessary to change your Bulldog puppy's diet for any reason, wait a least 2 weeks after your puppy's arrival in his new home and change gradually over a period of several days, adding little of the new food at the time to the food he is accustomed to. If you change from dry food to home-prepared food the change should go slowlier than if you just change from one brand of dry food to another. In its first year of life a puppy increases its body weight by 40 to 50 times. It therefore needs twice as much energy as an adult dog to satisfy this intensive metabolic activity. Optimal calcium levels are critical, since both deficiency and excess can have adverse effects, for skeletal development, which is not completed before the age of 12 months. While the growth stage of puppies generally ends at about twelve months, Bulldogs are mature at about 18 months and should be nutritionally treated as a puppy until about 1.5 years of age. After weaning, the puppy's digestive system is not yet fully developed. It therefore has a reduced digestive capacity, making it more delicate than an adult dog. This is especially true in situations of stress (when the puppy is seperated from this mother and littermates to go to his new home) or if it is confronted with parasitic infestations, as is often the case at that age. 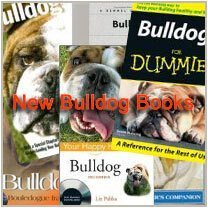 The Bulldog Information Library 2003-2010 © All rights reserved. Original idea, design and development by C. Marien-de Luca. No part of bulldoginformation.com may be copied, distributed, printed or reproduced on another website without the owner's written permission. Please feel free to link from your site to any of the pages on this website in a non-frame presentation only. Partner websites: Dogbreedsoftheworld.org, Puginformation.org, FunnyFlatFaces.com. Bulldog Information 2003-2011 © All rights reserved.